A new project featuring innovation and sustainability. Proposed 30 & 35 storey residential condominium towers with an industrial component. This innovative project incorporates work space in the podium of the north tower, and connects to future open space and linkages to the east. Unsurpassed views and all you need to live, work, and play. 30 Ordnance Condos will be a 500,000 square foot mixed use development with a podium containing the 26,000 square feet of office / studio use, and street related townhouses that will animate a new pedestrian walkway that will connect Ordnance Street Condos to the new park and bridge. Two residential towers will provide a wide range of unit types, most with uninterrupted views of the downtown skyline and Lake Ontario. Located just east of Liberty Village, 30 Ordnance Street is located adjacent to one of Toronto’s most vibrant new neighbourhoods. Within walking distance of the lakeshore and the entertainment/shopping/gallery districts of West Queen West, Trinity Bellwoods Park, King Street West and Ossington, 30 Ordnance Street is also a quick bike or streetcar ride away from the downtown core and financial district. The site faces the new parks being added to the Fort York precinct and will thus have protected views of the dramatic downtown skyline to the east. This boutique building, located right in the heart of Fort York, will connect residents to the many places that will make Local Condominiums a haven in the heart of the city. Characterized by a contemporary use of glass and brick, a 13-storey tower will rise from the West while a seven-storey podium grounds the building from the East. This expansive podium will also serve as home to the many shared amenities of the Local Lounge, located on the seventh floor overlooking your new community. Harmoniously blending modern architecture with Fort York’s historic appeal, Local Condominiums creates an ambience that is both fresh and welcoming. Prime location. Unparalleled value. Exceptional design and construction. This is the heart of Local at Fort York. Ideally situated at Toronto’s Harbourfront, Local Condos you conveniently at the crossroads — and each path is equally enthralling. In minutes, meander towards the heart of the city, and you’ll find yourself in a haven for art, culture, and dining. Turn around, and you’re gazing upon lush green trails and sparkling blue water. When you’re Local, the world is literally a footstep away. Local Condos Nestled among a myriad of outdoor options, living at Local Condos means having year-round access to some of Downtown Toronto’s most beautiful natural spaces. Multi-purpose room with cocktail lounge, bar and chef’s kitchen. Contemporary designed baseboards, door frames and casings. Dimensions, square footage and floorplans are approximate only. Final dimensions, square footage and floor plans may vary and will be determined by final strata plan measurements. Final floorplans may be a mirror image of the floor plans shown above. The Developer reserves the right to make changes to the floorplans, project design, appliances, specifications, and features. E.&O.E. PROPERTY TAX: APPROXIMATELY 1% OF THE PURCHASE PRICES. Limited time offer & subject to availability. Special offering subject to change without notice. Representations and information contained herein do not form part of any Agreement of Purchase and Sale. Preview Price List for January 25, 2012 – Prices subject to change without notice E. & O. E.
A sleek tower of glass and steel lets you take in open views of all the great places that make The Yards a unique haven in the heart of the city. Embrace views of the lake, downtown Toronto and the CN Tower, and the vast green space of Fort York itself. At street-level, a six storey podium grounds. The Yards and is home to a number of convenient shops-not to mention the many shared amenities at the Y Club that come with life at The Yards. Contemporary architecture complements Fort York’s historic appeal by blending sophistication with smarts, creating an atmosphere that is modern in design and welcoming in feeling. Prime location, Unique vision and value, Outstanding design and construction. This is the foundation of The Yards at Fort York’s architectural design. The price starts from $184, 203. A limited collection of 2 story Rooftop suites and ground level Townhomes offer a luxury haven within a haven. These expansive 2 BR and 3 BR suites, 965 to 1550 sq ft. boast large terraces up to 500 sq ft and very spacious kitchen and living areas. The penthouses at the 31st and 32nd floor offer panoramic views of lake and city – and the most striking skyline of Toronto as it transforms into a world-class city. These luxurious 1,000 sq ft suites, $514,000 to $591,000, are an absolute steal as they are priced in the mid $500s/sq ft. 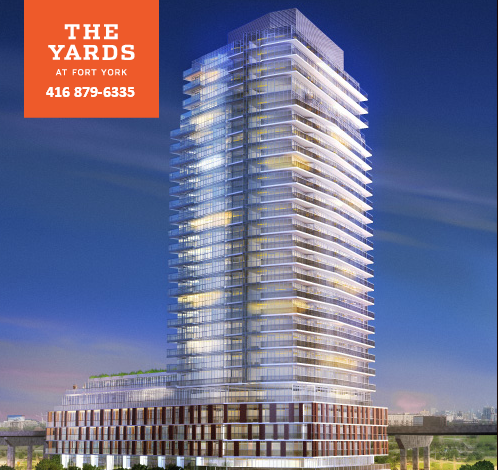 The Yards at Fort is very much the new hot area for condos in Toronto. Top builders have actively started developing the latest lifestyle communities here. Recent condo projects include Library District, Quartz, York Harbour Club, LTD, and Waterpark City. But The Yards is arguably the most impressive because of its scale, retail/convenience component and central location next to Fort York – which creates a center of gravity that will catalyze the growth of this waterfront area to the next level. i) Each person is limited to 2 purchases at all Onni’s Fort York Community projects based on First Come First Serve. ii) VIP Client Program is a limited time offer only and subject to change without prior notice. iii) Deals must be signed accompanied with all deposit cheques and a copy of government issued photo I.D. Full Price list and floor plan available upon request.